Personal Highlights: A visit to the antiquities stored in the Egyptian Museum accompanied by your personal guide A Dinner Cruise on the Cairo. This evening you depart on your overnight flight to Cairo which bhgat , described as "this little world, the great Cairo...the most admirable and the greatest city seen upon the earth... the microcosmos of the greater world..."
Upon arrival you will be met by your guide for a private transfer to your hotel. As you drive to the hotel you will start to be immersed in the culture of Cairo. Cairo has been the largest city in Africa for centuries. Modern Cairo encompasses many former cities and their monuments: the pyramids of the pharaohs, early Christian monasteries and churches; Salah al-Din's Citadel; mosques of the Mamluke and Ottoman sultans. Five thousand years of culture are concentrated here, at the center of three continents... and you are part of it. This evening you have a relaxing dinner at your hotel overlooking the Pyramids. Cairo is really three cities in one, Pharonic Cairo, Coptic Cairo and Islamic Cairo and each continues to influence the city. After breakfast you will be picked up at the hotel and taken to the Egyptian Museum for an introduction to Pharonic Cairo. This is one of the world's most famous museums. The magnificent collection of antiques includes mummies, Sarcophagi and the highlight of it all... the fabulous treasure from Tutankhamun's tomb. After lunch at a local restaurant, you will see the Islamic side of Cairo with a visit to the Mohammed Mosque and the Citadel of Salah Al-Din. Built between 1176 and 1182 AD, the citadel provides a panoramic view of Cairo from the Moqattam Hills. This evening you enjoy dinner as you cruise the Nile and view the sights of Cairo by Night. An early morning departure from the hotel to the airport for the short flight to Luxor. Originally called Thebes: or the "one-hundred gated city" as it was later called by the renowned Greek historian, Homer, because of its buildings and large gates. And the Arabs, impressed by its beautiful palaces re-named it Luxor: City of Palaces. Luxor is divided by the Nile. In the East is city of the Living, where the life-giving sun rises; and in the west is the City of the Dead, where the sun, in its never-ending orbit, bids farewell to life. You will start your exploration on the west side of the Nile where you will visit The Colossi of Memnon, two statues, 60 feet high, the only remains of a temple commemorating Amenhotep III. You will then visit the Tombs of the Valleys of the Kings and Queens carved into the rock face to safeguard them against grave robbers (unsuccessfully) they include the tombs of Nefertari, wife of Ramses II, Seti I, Ramses III and Amenhotep II. After lunch you visit the East bank to explore the Temple of Luxor built by Amenhotep III and Ramses II. you conclude your Luxor excursion with a visit to the temple of Karnak world famous for its history and architecture. You return to the airport for the return to Cairo. Your day begins with a visit to Memphis. One of the oldest cities on earth, legendary Memphis was the capitol of ancient Egypt during the Old Kingdom (2705-2155BC). You then visit Saqqara, the royal burial ground during the Old Kingdom. There are so many periods represented that Saqqara could almost be a book, in whose pages the story of Egyptian Civilization through the Pharonic, Greek and Roman periods are told. Your last visit is the reason many people visit Egypt. You will stand face to face with The Sphinx, the "sacred symbol of the union of the strongest physical with the highest intellectual power on earth" and stand in awe of the Pyramids. 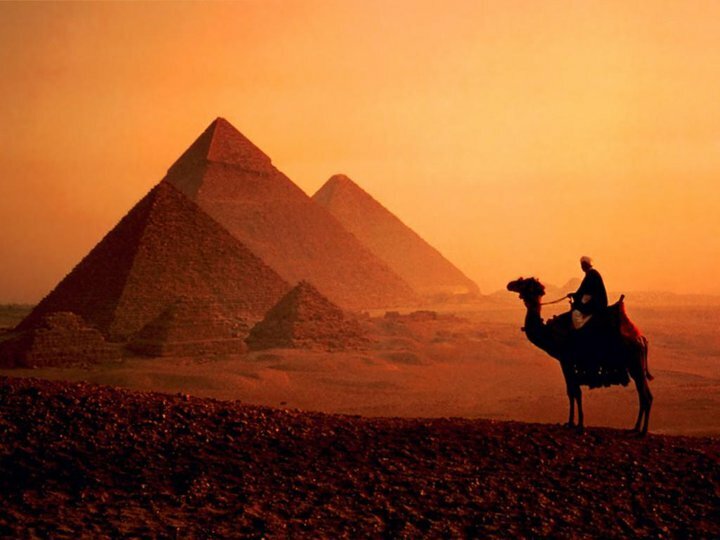 One of the seven wonders of the ancient world, King Cheops' pyramid was built in 2650BC and as Amelia Edwards said in 1877 "it is impossible to get tired of the Pyramids" You return to your hotel to relax and freshen up before heading to Cairo for a true taste of Egyptian cuisine. After breakfast, your guide will pick you up and take you to Old Cairo to visit the magnificent Coptic church of St Sergius where Jesus and his family stayed after fleeing from Jerusalem. You will then visit the Ben Ezra Synagogue the oldest in Egypt and the first and oldest mosque in Egypt. After lunch at a local restaurant the rest of the afternoon is free for last minute shopping. Tonight, a special farewell dinner accompanbied by VIP seats for the sound and light show at the pyramids. After breakfast, your driver will be waiting to take you to the airport for your return flight to the US arriving later that same afternoon.